What can chickens eat in your garden? Well, plenty. But you have to grow something first! And luckily, this article will show you everything you can grow as treats for your backyard chickens and ducks! I’ve invited my friend Julia of ReformStead.com to tell us how she transforms her garden into a chicken garden each year! Growing fruits and veggies for your chickens is easy – and it’s a great way to provide fresh produce to your flock! What Can Chickens Eat In Your Garden? What Garden Produce Do Chickens Eat? Planting a garden is a great way to provide an abundance of fresh, healthy food for your backyard chicken flock. It’s easy to add some of your chicken’s favorites to the garden and grow them alongside your family’s vegetables. All you have to do is harvest and feed them to your chickens once they are ripe. As a bonus, this can help you save money on your chicken’s feed bill. 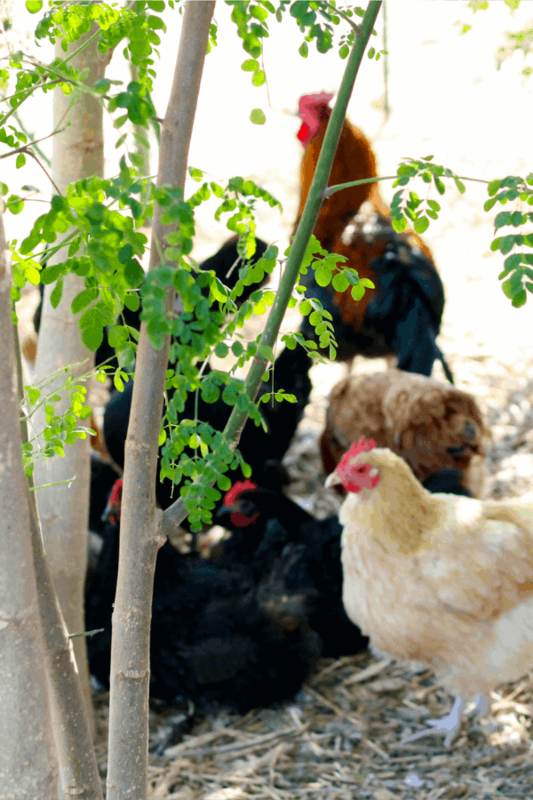 With a little planning, you can do your best to provide your flock with access to these fresh fruits and vegetables year-round. Planning a garden for your chickens doesn’t have to be complicated. It’s a good idea to have something green, or fresh, for them year-round. Pasture grass can serve this purpose during warmer seasons, however extra produce is still good for them in addition to pasture. It’s also good to keep in mind that your chickens lay more eggs when the weather is nice, and that’s usually when you’ll harvest the most fresh vegetables. Greens high in omega-3’s, herbs, and any fresh garden produce is especially good to feed your chickens during this time (you can find a complete list of alternative feed for chickens here). If you’re wondering “What can chickens eat from the garden,” in the following lists, I’ve focused on produce that your chickens will love best and that are easy to grow. However, don’t forget “weeds” like purslane, mallow, dandelion, and many more are great for chickens. Make sure to harvest these “weed” greens for them too as you find them in your garden this year. Before we get to the list though, let’s talk about what chickens can eat, and what they should avoid. It is important to know what chickens can and cannot eat before you plan your garden. Chickens can eat practically anything, within reason. For starters, here’s a list of 107 things a chicken can eat. There are a few plants/foods you’ll want to avoid growing for your chickens. However, there is some debate over whether or not some of these are really bad for chickens. You can read more details in my article, 11 Things Not to Feed Chickens, where I go into this subject in more detail. Find out what else to plant in April here. After the last frost, you can transplant seedlings out (after hardening them off) and plant squash, melons, tomatoes, basil, dill, etc., from seed. Find out what else to plant in May here. If you want to buy produce at the farmers market, here’s what’s in season. Find a list of what’s in season at the farmer’s market here. Winter squash (you can learn how to make squash into a hanging treat here). Julia Hubler lives in Arizona on two and a half acres, with HOT summers, lots of cacti and amazing sunsets! A sinner saved by grace first and foremost, she is also a homeschool graduate living with her family at home and serving the King, Jesus Christ, above all. She blogs at ReformStead.com about everything homesteading. You can also follow her on Pinterest https://www.pinterest.com/reformstead/ , Instagram https://www.instagram.com/reformstead/ or Facebook https://www.facebook.com/reformstead/ . Still wonder “what can chickens eat in your garden?” Probably not – there’s so many options! Have fun planting your chicken garden this spring! What can chickens eat in your garden? Well, plenty. 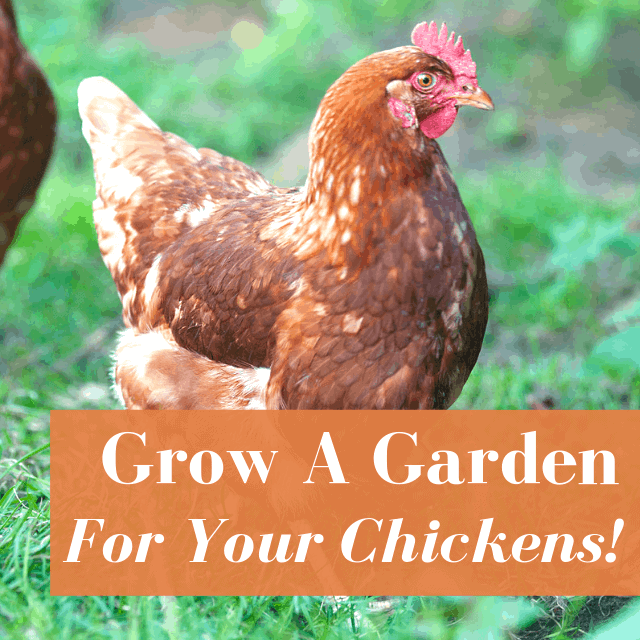 This article shows you everything you can grow as treats for your backyard chickens and ducks!